Dr Lilliana Gilla Lulli obtained a BSC in Human Physiology and Psychology from the University of Johannesburg, and an MBChB from the University of Pretoria. After three years of service, at Tembisa Hospital, she decided to explore the lighter disciplines of medicine. In order to meld her artistic and medical skills, she decided to join The Renewal Institute. She shares a combined fascination with Italian automotive marquess and the minutia of the beauty industry. She is a passionate Formula 1 fan, the ambassador for Maserati South Africa and the reigning Mrs South Africa 2nd Princess 2016/ 7. She is excited about helping patients awaken the best versions of themselves, and is a nurturer of confidence. 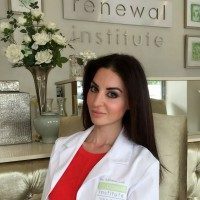 She has a passion for anti-ageing from the inside out and looks forward to sharing knowledge and innovations with her patients. Currently, she is consulting from the Bedfordview, Morningside, Fourways and Illovo branches.